High Volume Data Collection - Collect hundreds of sales leads and thousands of survey questions from your prospects. 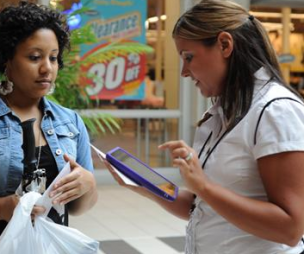 Surveying brand ambassadors will be placed in high traffic locations, uniformed in your companies clothing. Uniformed Brand Ambassadors will collect real sales data with hand held survey devises. We will help create fun and engaging questions to get the answers you need. Each prospect will also be given a take-away company postcard. Real Time Messaging - Mid-show, 3D will send out a “survey relevant” email requesting an at-show appointment or booth visit. This trade show lead follow-up is in real time. Real Time Reporting - Leads and reports are communicated to the sponsor in real time, allowing actionable at show sales and follow up. This Promotion Includes - One scripted & uniformed brand ambassador, survey design, survey collection, Post card distribution, real time “survey response” email, and post event survey report.